Roughly this time last year I featured the brand Stick to Stigu on my blog after I'd been in contact with the lovely Helena. 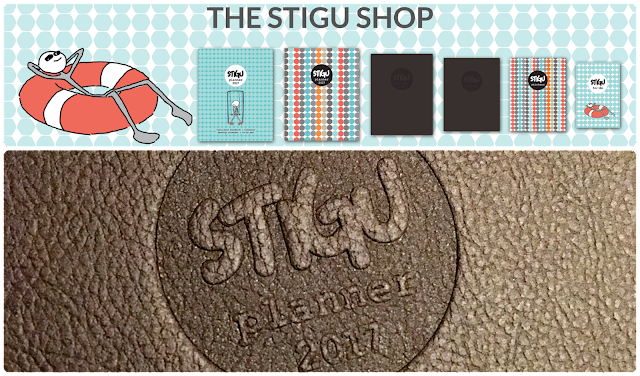 Well, a couple of weeks ago Helena kindly contacted me asking if I would like to receive the Stigu 2017 planner. Of course after last years I jumped at the chance and today I'm going to show you the new hard cover design and see if there's any change from last year. This year I am particularly impressed by the sleek and professional looking design. I can definitely imagine this sat on a desk in a workplace and no one would bat an eyelid where as last years design made it very obvious it was a bit more than just a diary. However, if the old design has a special place in your heart, they've brought back that spiral bound look with some new patterned fronts so you won't be disappointed! Once again Helena left me a cute little post-it note inside the front cover. PR done right I'd say! As an added note I'd just like to say how friendly the team are at Stick to Stigu - it's always a pleasure receiving emails from them and it's definitely a business I would say to support! As with last years design, the first page is full information on planner and the brand itself. All of the points are pretty much the same as last year just with the occasional refresh. It also stresses further up that they want you to find what works best for you to make your life easier. Something new this year is a goals page which I love! Such a good motivator for 2017! I can't wait to fill this in and keep referring back to it through out the year. On the left hand side is the 'please return to...' page which I think is a lovely detail for if you're a bit dizzy like me! Through the planner there are little added extras that are super cute, such as a Merry Restmas sign on Christmas day and various shapes and designs for you to fill in with meetings and commitments. My favourite are the lovely little love hearts in February. Of course, most of you usual annual holidays are added in there too such as Easter, Halloween and New Year! Then of course, as with last year, the left hand side is for all your rest and zest mini practices. Once again I absolutely love the illustrations on these, including the little stick man looking like he's having the best time! These sections feature everything from recipes, fun art activities and even exercises which means there will be pretty much something for everyone. Not to forget the amazing quotes written on each and every double page through out the planner! Here I have picked one of my favourites after a quick flick however there are lots of amazing and inspiring ones quotes from a variety of people. I'm hoping to use my Stigu Planner to remain as positive and motivated as possible in 2017 whilst having fun too! Huge thank you to Helena for thinking of me again this year. Disclaimer - This post is not sponsored however Helena at Stick To Stigu kindly sent me the item shown for review. All opinions are my own.